Referee: Phil Dowd‎ | Attended :‬ ? Norwich City (0) : . Man Utd (1) : Danny Welbeck[57']. Ruddy (GK); Martin, R Bennett, Bassong (c), Olsson; Fer, Johnson; Snodgrass, Hoolahan, Redmond; Hooper. Substitutes : Bunn (GK), Whittaker, van Wolfswinkel, Elmander, Garrido, Becchio, Josh Murphy. De Gea (GK), Smalling, Vidic, Evans, Evra; Young, Cleverley, Carrick, Giggs, Kagawa, Hernandez. Substitutes : Lindegaard, Anderson, Welbeck, Fabio, Fletcher, Zaha, Januzaj. 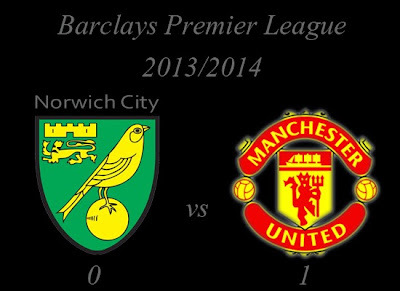 How do you think about Barclays Premier League : Norwich City vs Manchester United?